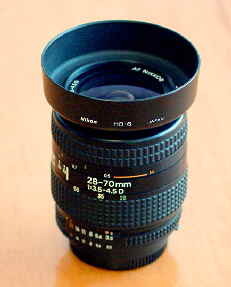 The Nikon 28-70 f3.5-4.5 AFD isn’t that impressive to look at or to hold. This is a very small and lightweight standard zoom, which looks and feels a lot like lots of other cheap modern lenses. Zooming action is a bit uneven and it comes with a very basic looking lens hood, so you wouldn’t expect much, but, appearances can be deceptive. I bought this one on ebay as my first lens for my Fuji S2 Pro and was impressed with both the camera, and this lens’s performance. Considering what I paid for the lens I really wasn’t expecting to keep the lens for long, but for such a small lens the Nikon AF 28-70 f3.5-4.5 produces excellent results - if you’re looking for a cheap starter lens for a Nikon digital SLR, and can’t stretch to the Nikon 18-70 DX, then, this is it. Performance is in a totally different league from the plastic G series kit lenses supplied with Nikon 35mm film cameras. Small and fairly lightweight, build quality is good rather than super smooth. Everything works perfectly OK, but the lens doesn’t feel like anything above average. There are no real vices in the lens’s handling though, with a good sized manual focus ring and a small click stopped aperture ring, with a sliding lock for auto settings. This is a good performer at all settings, and a large part of it’s superior performance is down to a small piece of plastic. It was one of the first lenses to have a moulded aspherical component - A plastic element glued to a conventional glass one. At the time Nikon purists all gasped - moulded plastic in a Nikon lens? The fact is it worked and the technique is now commonplace. What really mattered was how well the lens performed. and must not be reproduced in any way without permission.